The Countenance Divine is Michael Hughes’ first novel, and it’s an ambitious start. Set in four different time periods and told through four very distinct voices, it’s heavily influenced by the work of Milton and Blake, has visionary, macabre and apocalyptic elements and hints of psychogeography. The blurb that accompanied my copy compares it to the work of David Mitchell (to my shame I haven’t ready any David Mitchell, so I couldn't say how accurate I think this comparison is) although it reminded me a little of some of Scarlett Thomas’ books, with elements of Nicola Barker's Darkmans. The first character we meet is Chris in 1999, a computer programmer working on protecting clients’ systems against the infamous Millennium Bug. Chris’ chapters are narrated in the third person, but the unadorned, blunt clarity of the language here is an obvious reflection of his methodical, logical character and the source of some unexpected humour. Chris holds something of a torch for his colleague Lucy, but is unsettled by the chaos that seems to surround her – her apparent emotional instability, her strange self-destructiveness and her associates with their mysterious underground project whose purpose is not immediately clear. There are some strange echoes in Lucy of the Ripper murders which took place in 1888 in the same part of London, and indeed, it’s Jack that we hear from next, through the medium of his own semi-literate letters. These letters are every bit as gruesome and chilling as you'd expect, but the more we learn of Jack, the more it becomes clear that someone or something is guiding him. Once again, Hughes gives Jack a highly distinctive voice, so although we learn only a few small details about his background, he quickly becomes a vividly three-dimensional character as he applies his own terrifying rationale to his motives. 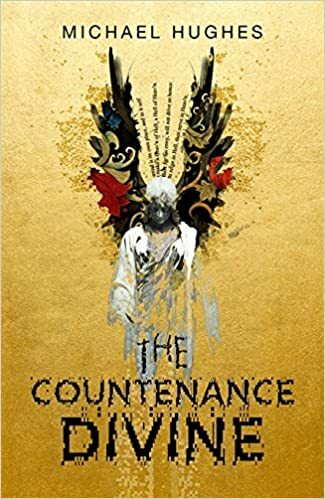 It's really when we meet the visionary poet and engraver William Blake in 1777 and an assistant to poet and playwright John Milton in 1666 that The Countenance Divine takes a stranger turn. Blake, prone to hallucinatory visions, is compelled to create a homunculus from one of the dead Milton's ribs; Milton himself, whose elements of the story are told through the diary of his assistant Allgood, is finishing Paradise Lost just as the Great Fire of London destroys the city. Allgood's diary is written in an exceptionally authentic 17th century style, which is flawlessly done, but also makes these chapters a little hard-going; you will need to invest more time and concentration here. If you enjoy books which offer neat explanations and satisfying revelations, this is not a novel for you. There are countless hints, clues and allusions throughout, as the four time periods begin to overlap and collide, but they don't lead to any clear conclusion. You'll be left to decide for yourself if the world is really about to end, what's 'real' and what is imagined, and who a figure in a golden mask who seems to exist simultaneously in different times might really be. It's also worth pointing out that I came to this book pretty familiar with the work of both Blake and Milton - if you don't, you will miss out on some of the references. I don't think this will affect a reader's overall understanding, but it won't be quite so rich a reading experience. This is an exceptionally well-written novel - the four styles Michael Hughes uses are very different, yet each of them is executed brilliantly - which excels in creating a gathering sense of doom, conjuring up the unsettling, oppressive atmosphere of a world, and in particular London, on the brink of catastrophic disaster. If I have a criticism, it's that it's occasionally a little slow, which is always dangerous in a novel that requires attention to detail on the reader's part. The Countenance Divine will published on 11 August. My thanks to John Murray Press for providing me with a review copy via NetGalley.